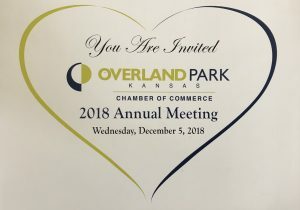 The Annual Meeting of the Overland Park Chamber of Commerce is Wednesday, December 5th, 2018 at the Convention Center. Miracles With Water is thrilled to be one of the Sponsors and we are so looking forward to hearing the great things that happened in 2018 for our Chamber and we are very excited to hear the great new things the Chamber has planned for 2019 !!! Get involved in your local Chamber as it is a great way to meet other business professionals in your local market as well as learn from other top leaders in your Community. Visit www.OPChamber.org and let them know Cathy Weaver sent you !! !